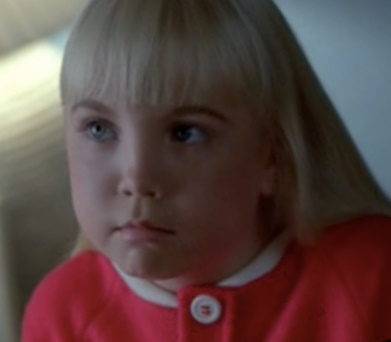 Fourth Grade Nothing: Remember Heather O'Rourke From Poltergeist? Yesterday, I blogged about Strawberry Shortcake and in my research I discovered an old commercial featuring child actress Heather O'Rourke. Most of my readers were born in the mid to late 1980s and are likely to comment that they don't remember her. It is my duty as a retro blogger, to introduce you to this adorable little actress. Sadly, little Heather died rather suddenly of complications due to Chron's disease on February 1, 1988. For the full story visit her official site here. Yes, there are many urban legends about crazy curses that affected many of the cast members of all three Poltergeist movies. Not to take away from this post dedicated to Heather, I encourage you to read more about that over at TheBeyond. 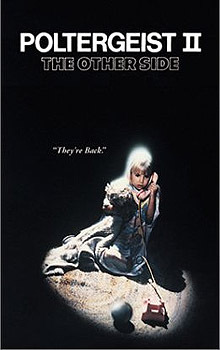 Best Known For: Carol Anne in Steven Spielberg's Poltergeist, Poltergeist II and Poltergeist III. Heather's first appearance on Happy Days. An original news broadcast from 1988 announcing Heather's death. Poor thing. Poltergeist is actually one of my all-time favorite scary movies however I can't watch it unless its daylight & I'm with someone. It still freaks out. She was so cute in all 3. Poor thing, really. R.I.P. I know her! They're baaaaack Carol Ann...I used to love scary movies even as a kid! This movie was waaaaay too scary for me. Even today I won't watch it. I can't even look at her, because of that goddamn movie! I'm with Cheeseboy... STILL cant watch it. Her story is just so sad. It's one of those ones I always stop on when I see a special. It's even more contrast by the fact that Zelda Rubinstein just died this year. What an amazing little actress she was to scare the crap out of everyone. I had no idea, Ally, that she died at age 13 (Is that right?). I also didn't know that Crohn's disease can be fatal. Very sad. She would've gone really far as an actress. Once again, I couldn't get the second video to work. I loved all the Poltergeist movies and faithfully watched Happy Days. I thought Heather died from an intestinal blockage. Didn't realize she had Crohn's. I remembered when she died. Very sad. And the movies scared me back then. I remember her. I remember the story about her dying and the rumors it was the movies that killed her. Still to this day when I see her picture or her that line I get chills. I've never seen those movies. Her death seems like an interesting story though.. which I think is what I would like people to say about my death. "Sure his life wasn't much, but did you hear about how he died?" I never saw Poltergeist. She is cute. I love Happy Days. When did you get 400 followers? I am sooooo jealous. You deserve it though. You are awesome. I was born in 1981, so I was young when Poltergeist came out; however, it was my favorite movie! My grandparents had let me watch it (much to my mother's dismay). I loved "Carol Ann" and was so bummed when I later found out that she had died as a child... it intrigued me. I am old enough to remember her, she was the it kid actress. She seemed to be in everything! I wonder if she would have made the transition into an adult actress....so sad. So sad when she passed. wanna feel real old? Her mom on Happy Day's just played Pam's mom in the office. Still looks good though. I remember her dying. Wow, had she lived she'd be just one year older than me now. So sad. I love the Poltergeist movies! To this day, they are some of the few that truly scare me. my mom is terrified of her. My future husband and I went to see Poltergeist on our first date. oh, memories. Poor gal. Dominique Dunne (daughter of Dominic Dunne) in that movie also died (murdered)...both died way way too young. I was born in 75, so I remember the movies being out there, but I was way too scared to watch them. I do have a very good friend named Regan after the little girl in The Exorcist! After she died someone told me it was cuz her bladder exploded. So when I see her in Poltergeist that's all I can think of. How did such a young person have crohns anyway? Wow it was Chron's disease? I had no idea! Still so so so sad. Poltergeist will forever be one of my most favorite films! I don't do scary movies, like AT ALL, but had to watch Poltergeist for a film class. Didn't sleep for weeks, then I watched the E True Hollywood story on all the weird stuff that happened to those associated with the movie. Waaaay too creepy for my liking. Still super sads. That was so sad. I think the intestinal obstruction led to septic shock, also, which once that happens, your body pretty much shuts down. And that movie was so crazy scary. To this day I watch it from behind my hands. Heather is one of my favorite actresses and Poltergeist one of my favorite films. I have seen many of her tv performances - my favorite is "Believe You Can and You Can," a 1985 tv special she starred in (pretty much alone) in Disney Land. Cute! So sad that she died so young, though. I bought an autographed photo of Heather from her sister, Tammy, several years ago.